Pick up from your Mombasa hotel or Airport in the morning and drive to Tsavo East national pack which is renowned for its large numbers of elephants and the famous man eating lions. You will arrive via game en-route to Voi safari lodge where you will have your lunch. 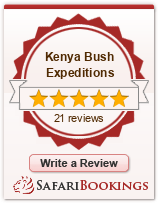 Later In the afternoon you proceed to Tsavo west with game en-route visiting Rhino sanctuary. If you’re very lucky you might see black rhino. After this exiting afternoon game drives, you proceed to your lodge. Ngulia safari lodge is perched on the Ndawe Escarpment just below Ngulia Hills and overlooking the Rhino Sanctuary. You will enjoy your meals as you watch the leopard feast at around 6pm.Dinner and overnight. Early morning breakfast, after breakfast you proceed for a morning game drive with a visit of Mzima Springs, Where you can see hippos and fish in a crystalline clear water. There are possibilities of seeing crocodiles and monkeys. Later depart for Mombasa with your lunch on the way. After lunch proceed to Mombasa arriving late in the evening dropping at your hotel or Moi international Airport.